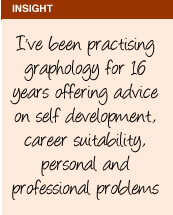 I studied Graphology professionally for three years and have been practising it for 16 years in England, Jersey, Portugal, America, Australia and New Zealand. Most of my career as a graphologist has been with private individuals and this has honed my analytical skills as I have been speaking to people about themselves and the people closest to them. I have worked around the world in festivals and private establishments doing “on the spot” analysis as well as written reports. I have also given presentations and taught graphology courses. My experience as a graphologist has been diverse and has ultimately equipped me to work in any area that handwriting analysis is required.